The College Station City Council had its first workshop about the proposed FY19 city budget on Monday at the CSU Meeting and Training Facility. The three-hour session primarily covered the city’s general fund and capital projects. On Tuesday, the council will focus on special revenue funds, enterprise funds, internal service funds, hotel tax fund, and outside agency funding. A third workshop could happen Wednesday if needed. Proposed FY19 General Fund revenues are $81.4 million, a 3.8 percent increase. The total net taxable certified value of property is about $9.5 billion, an increase of 6.6 percent from 2018. The increase in value is due in part to $403.2 million in new construction and development being added to the tax rolls. Existing property values grew by just over two percent. The core services of police, fire, emergency medical services, public works, and parks and recreation account for about 65 percent of the city’s expenses. About 41 percent of new spending requests for FY19 were made by the public safety departments. 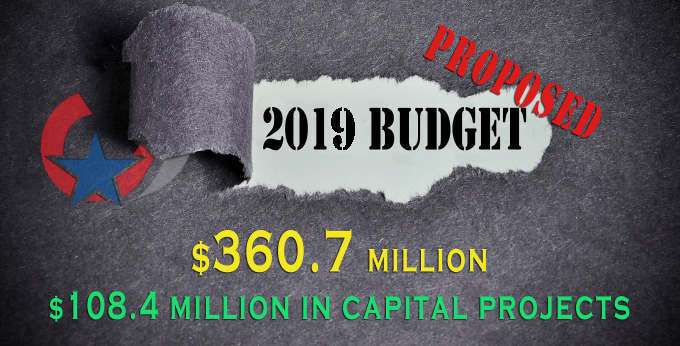 Capital projects account for almost a third of the proposed budget. Included is $34.8 million for electric, water and wastewater utilities, $35 million for streets and transportation, $12.3 million for parks and recreation, and $30.2 million for facilities. The remainder of the capital projects budget is for special revenue items such as the synthetic fields at Veterans Park & Athletic Complex and the new Southeast Park — which will both be paid for with Hotel Tax Funds — and community development, drainage, parkland and minor sidewalk projects. Standard & Poor’s gives the City of College Station an AA+ rating for both general obligation bonds and certificates of obligation. Moody’s upgraded the city’s rating to Aa1 in 2018. The city’s debt service for FY19 is about $20.5 million. A public hearing on the proposed tax rate is scheduled for Sept. 5 at city hall. A public hearing on the budget and tax rate will be Sept. 13 at city hall. Budget and tax rate adoption is set for Sept. 27.